Add our store to your favorites and receive exclusive emails about new items and special promotions! 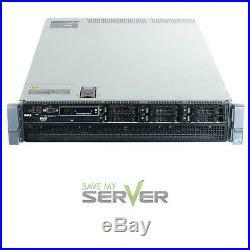 Dell PowerEdge R810 Server Xeon X7550 2.0GHz 32-Cores 64GB RAM 6x 146GB 10K. At SaveMyServer we put our heart into our business and stand behind our products. We want you to be satisfied. Dell PowerEdge R810 Gen 1. 4x Intel Xeon X7550 - 2.00GHz 8 Core. 6x Dell R-Series 2.5 SAS 146GB 10K Hard Drive. 6 Drive Bays, blanks not included. 6 x PCI-e G2 Slots - 5 x x8 Slot, 1 x x4 Slot And 1 Storage x4 Slot. Redundant Hot Plug Power Supplies - Power Cords Not Included. Backplane for 6x 2.5 SAS/SATA/SSD Drives. Onboard Quad Gigabit 1000 Pro - 4 Ports Total. PERC H700 RAID Controller w/ 512MB Cache. Software Media or Licenses are not included. At SaveMyServer we stand behind our refurbished servers. For our testing process we follow the same routine that we use to load our production servers. Build an array (if applicable). Update the drivers and firmware. Install the operating system and run diagnostics. That's right, we perform a clean install on each server. For most servers, we load a clean install of Windows 2016 Server evaluation edition. We also perform the Dell OpenManage PowerEdge updates, bringing the components like the system bios, PERC RAID, network interface and other Dell drivers up to their latest version. We can spend hours refurbishing a server. We don't use ghost images because they are unreliable across different configurations and third party components. When a server goes out our door, we know that it is ready for a production environment. We have many different server configurations available and options. If this happens, don't worry, we will stand behind our products! We cannot guarantee compatibility with your equipment or software. Product availability is not guaranteed after 7 days. If you, for some reason, can not pay within 7 days, please notify us of your situation. SaveMyServer is a fast-growing asset management company located in Suwanee GA. We offer IT liquidation, remarketing, recycling and asset management services. Whether you need to increase, reduce, or inventory your used IT assets, SaveMyServer can provide the service and products for you. SaveMyServer is partnered with remarketing companies across the US, making the benefits available right where you are. At SaveMyServer, our goal is to meet consumer needs for less expensive, refurbished servers. On one hand, we see a demand for affordable servers; other businesses need to handle server inventories they wont be using. SaveMyServer is the solution to both challenges, as an asset management company that carries out the entire remarketing process. SaveMyServer is also a green recycling company. While remarketing used servers keeps them from prematurely crowding landfills or storage, sometimes parts are broken or out-of-date. In those instances, SaveMyServer recognizes the continued need for proper disposal. Whatever we cant use, we recycle. SaveMyServer Item Information: 10AA - AutoAdmin - 19267 qid: 36684. The item "Dell PowerEdge R810 Server Xeon X7550 2.0GHz 32-Cores 64GB RAM 6x 146GB 10K" is in sale since Tuesday, November 14, 2017. This item is in the category "Computers/Tablets & Networking\Enterprise Networking, Servers\Servers, Clients & Terminals\Computer Servers". The seller is "savemyserver" and is located in Suwanee, Georgia. This item can be shipped to United States.